This is the last Sunday of our liturgical year. Next Sunday begins the Advent season as we prepare our hearts to receive our Lord and King. As with our readings last week, our Church turns our attention to a foremost reality of our faith - that Jesus is the Christ, the anointed on of God. He is Lord of the universe but also must be Lord of our hearts, our minds, our lives, and our families. Our first reading (Daniel 7:13-14) is the passage Jesus quoted in last week's Gospel, saying, I am he, "The one like a Son of man coming on the clouds" . . . the one "who's dominion is an everlasting dominion." As the visions during the night continued, I saw one like a Son of man coming, on the clouds of heaven; when he reached the Ancient One and was presented before him, the one like a Son of man received dominion, glory, and kingship; all peoples, nations, and languages serve him. His dominion is an everlasting dominion that shall not be taken away, his kingship shall not be destroyed. In our Gospel reading (John 18:33-37), we hear a scene from the passion narrative of the evangelist John as Jesus was interrogated by Pilate. Jesus answered, "My kingdom does not belong to this world." Jesus is not like any king the world knew. He is a servant king, one who reigns in love, not in violence, one who seeks the lost and rescues them. Pilate said to Jesus, "Are you the King of the Jews?" Jesus answered, "Do you say this on your own or have others told you about me?" Pilate answered, "I am not a Jew, am I? Your own nation and the chief priests handed you over to me. What have you done?" Jesus answered, "My kingdom does not belong to this world. If my kingdom did belong to this world, my attendants would be fighting to keep me from being handed over to the Jews. But as it is, my kingdom is not here." So Pilate said to him, "Then you are a king?" 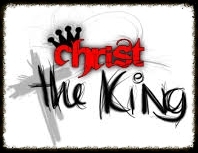 Jesus answered, "You say I am a king. For this I was born and for this I came into the world, to testify to the truth. Everyone who belongs to the truth listens to my voice." In our Epistle reading from the Book of Revelation (RV 1:5-8), John tells us "he is coming amid the clouds" and that he has made us into "priests for his God and Father." As priests, we who believe in the Christ are mediators between the people in our lives and God. We are called to teach, to witness, to love as our model Christ did for us. Jesus Christ is the faithful witness, the firstborn of the dead and ruler of the kings of the earth. To him who loves us and has freed us from our sins by his blood, who has made us into a kingdom, priests for his God and Father, to him be glory and power forever and ever. Amen. Behold, he is coming amid the clouds, and every eye will see him, even those who pierced him. All the peoples of the earth will lament him. Yes. Amen. In this "Solemnity of Our Lord Jesus Christ, King of the Universe", we are reminded that Jesus is King of all creation. Because of that, we are called to invite Jesus to reign as Lord and King of our hearts, our families, our avocations, our professions, our hopes and dreams, every aspect of our lives. To do less is to do injustice to our faith, to make Jesus a part-time king (with a small k). Jesus invites us to "Choose Christ."